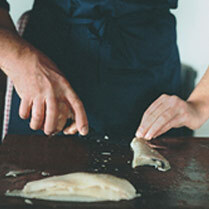 There are several advantages to filleting fish for cooking, says chef and food stylist Jacque Malouf. It reduces the cooking time and makes it easier to portion and eat. It is particularly useful for bigger fish, especially meatier varieties that don't easily fall apart. Filleting also allows you to eat the fish over several meals. Small, flat fish are fiddly to fillet, so it can be easier just to cook them on the bone and remove the flesh after. Most fish you buy will be scaled and gutted and although any fishmonger will also fillet it for you, it's a good skill to have and surprisingly simple to do. Cut off the fins using a pair of sharp kitchen scissors. Cut off the head from just behind the gills. Using a filleting knife, make a slit along the backbone from the head end to the tail. This gives you a central division to work from. Starting in the central division at one end, slide the knife under the flesh and as close to the bone as possible. Remove the first fillet by making long, even stokes towards the other end until you remove the whole fillet. Remove the other fillet on the first side. Turn the fish over and repeat on the other side till you have four fillets. Using a filleting knife, make an incision just behind the head and place the knife under the flesh along the backbone, running the knife across the length of the backbone until you release the whole fillet. Sever the end of the fillet at the head end and at the tail. Identify any 'pin bones' by running your finger along the fillets from head to tail. They can then be removed with fish tweezers. The most vital tool for filleting fish is a sharp and flexible filleting knife. The flexibility allows you to cut very close to the bone using long strokes, which minimise waste and create neater fillets. You will also need a pair of fish tweezers for pulling out bones and kitchen scissors for cutting off fins and tails. Fish can be frozen whole or portioned, provided it has not been previously frozen. Freezing fillets (or steaks) is the easiest method and uses freezer space well. Wrap it in several layers of clingfilm as improper wrapping can affect the texture of the fish. Place in small, labelled, airtight bags in the coldest part of the freezer. Apart from adding a wonderful texture, the skin on a fillet can also hold together delicately textured fish, especially thinner flat fillets, making them easier to fry and turn over. If you do want to skin a fish fillet, place it skin side down on a board. Position a filleting knife at the tail end and make a cut a few centimetres from the tail into the flesh towards the skin without severing it. Holding the skin of the tail end securely, wiggle the knife along the skin freeing the flesh. Keep the knife as close to the skin as possible, using the board as a guide. Waitrose supports sustainable fishing and has a policy of sourcing from well-managed fisheries. Here are details of some popular fish. Caviar: The beluga oscietra and sevruga sturgeon, the sources of caviar, are seriously under threat. Waitrose sells sustainable caviar on our fish counters, or a good alternative is Avruga herring roe. Cod: Waitrose sells only Icelandic cod - Iceland is considered of the most well-managed, sustainable fisheries in the northern hemisphere. Waitrose only sells line-caught cod, rather than trawled fish. Large trawl nets can cause damage to fish stocks - by catching small juvenile fish - and the marine environment, as well as snaring sea birds and marine mammals. Cornish Mackerel: Waitrose sells only line-caught Cornish mackerel. Cornish Sea Bass: Waitrose sells only line-caught Cornish sea bass. Haddock: Waitrose sells only line-caught Icelandic haddock for the reasons outlined above. Hake: European hake numbers are below safe limits. Waitrose only sells South African hake. Halibut: Stocks of North Atlantic Halibut are declining in European waters. Waitrose sells only Icelandic halibut; some is line-caught but the majority is farm-reared. When in season (March to November), Pacific halibut is air-freighted daily. Herring: One of the few fish in European waters where stocks are considered to be fairly healthy. Lemon and Dover Sole: Stocks of both, in European waters, are considered to be healthy. Monkfish: There are major concerns over the Scottish fishery so Waitrose is reducing the amount of monkfish sourced from Scotland. Around 65 per cent of the monkfish Waitrose sells is caught in Icelandic or Cornish waters. Plaice: Waitrose does not sell plaice during the spawning season, which is from January to April. Salmon: There are major concerns over declining stocks of wild Scottish Atlantic salmon and, as a result, Waitrose has not sold it for the past three years. As an alternative, Waitrose sells Alaskan salmon, coho and sockeye, air-freighted daily. Sardines: Waitrose sells only Cornish sardines, which are sustainably fished - caught on small day-boats using traditional fishing methods. Sea Bream: Waitrose sea bream comes from New Zealand - perhaps the best-managed fishery in the southern hemisphere. The fish is line-caught in small day boats, then air-freighted to the UK. Skate: Skate is a blanket name for the ray family. Atlantic skate and thorn-back ray are both under threat. Waitrose skate-wings are from blonde rays. Squid: There are no sustainability issues for squid. Waitrose squid comes mainly from Thailand. Swordfish: The North Atlantic swordfish fishery is under threat. Waitrose sells only swordfish from the Indian and Pacific Oceans. Trout: All Waitrose trout is farm reared. Rainbow and organic brown trout come from Lord Radnor's Longford Estate in Wiltshire, while Loch Etive trout is farmed in a Scottish sea loch. Tuna: Certain species of tuna, such as the southern bluefin and bigeye, are under threat. As alternatives, Waitrose stocks fresh, line-caught skipjack and bonito tuna in tins. Whitebait: Produced from the fry of herring and mackerel. Waitrose does not sell whitebait. Fish not stocked due to concerns over declining stocks include Antarctic sea bas, black marlin, coley and all members of the shark family, including huss (dogfish). The Fishmongers' Company Cook Book (The Fishmongers' Company; £25) is a great resource book with information on all types of fish and lots of recipes.